On March 20, 2018, the Jerusalem Center for Public Affairs held a significant discussion on the future of relations between Israel and Europe. As part of a closed forum, it hosted strategic and diplomatic experts from several European countries, including the EU ambassador to Israel. Over two days, we discussed misunderstandings regarding Israel’s position, and why there is no fundamental consideration for what happens in Israel every day. Why is there so much apparent naivete among decision-makers in Brussels? Why, at times, is there unjust hostility and automatic condemnations made against Israel? What is causing relations with a friendly, democratic country like Israel to erode? Why is there such a double standard and hypocrisy regarding the Palestinian issue? And of course, what is Europe’s true policy? How do they deal with two currently worrying topics – the war on terror and the migrant problem? We Israelis tried to understand why the Europeans conduct such head-in-the-sand diplomacy and why they believe that the nuclear deal signed with Iran in July 2015 is really a good agreement that will not be breached in the future. At the end of the discussion, Israelis felt that most of the participants had listened with utmost attention to our claims and even understanding for our position, with an honest concern for the future of the security of the State of Israel and its legitimate right to live in peace with all of its neighbors. We reached the initial conclusion that in Europe there are essential differences between the positions of the professional echelon and the political leadership and especially between honest, informal discussions and official debates and forums. Why does this gap exist? Why are European countries not bold enough to formulate clear policies? Why do they continue to speak in feeble language and even conduct hypocritical policies, especially regarding a solution to the Palestinian problem and human rights? This was recently expressed regarding Israel’s Nation-State Law, which was passed in the Knesset on July 19, 2018. The strong criticism that appears in most of the European media about Israel discriminating against the Arab minority also shows here a basic misunderstanding of the State of Israel and its very existence as the only Jewish democratic country in the world. There is a misunderstanding in the Palestinian context and confusion among the Europeans, who still think Judaism is only a religion and therefore the Jews have no right nor claim to a national homeland. Europe’s ignoring the close, historical connection over thousands of years between the Jewish nation and the Land of Israel and Jerusalem arouses surprise and even anger, especially when the European countries vote at UNESCO and other international organizations in favor of delusional, false Palestinian initiatives. Looking to Europe or to the United States? The Israeli Foreign Ministry has been holding feverish debates to formulate a clear policy for Europe. Most experts emphasize the importance of maintaining bilateral relations, but the tendency of most Israeli governments has been to reach out to the United States. Rightly, it has been stated that important fateful decisions have only been made in Washington, and that the United States, the world’s strongest superpower, can handle the resolution to the conflict with the Arabs. This is in contrast with Europe, which is leaning on a weak reed from the diplomatic point of view. The United States is a loyal strategic ally. On one level, this assessment is correct and justified, but it is not perfect. It is appropriate to mention that until the outbreak of the Six-Day War in June 1967, Israeli governments preferred, for various reasons, to strengthen relations with Europe at the expense of the United States, who at one time imposed an embargo on weapons exports to Israel. It should not be forgotten that in the early years after independence, France made an essential contribution to the State of Israel’s security by supplying modern armaments and erecting a nuclear reactor. At the end of the 1967 war, when the territories were acquired, there was a shift in France’s traditional position of supporting Israel since its establishment. This trend became – especially in France – pro-Arab and even hostile at times. Following the energy crisis that broke out after the Yom Kippur War, the European countries surrendered to the pressures and extortions of the oil distributors, preferring to sacrifice Israel on the altar of petrodollars. Over the years, Europe experienced many ups and downs, and the European Union went from being six states to nine. Today it has 26 members after the United Kingdom’s withdrawal. The European Union today represents more than half a billion people. As the years have passed, it has also made some strategic mistakes. The first of these was “expanding the club” to all states in Europe and outside of it. Five additional countries, including Turkey, officially offered their candidacy. It is clear there is a very big difference between a united Europe composed of nine to 12 countries and a Europe with 26 countries or more. An additional mistake was the removal of borders, which put an end to commercial protectionism and led to a flood of cheap goods from China. This, in turn, led to the closure of European factories and growing unemployment. Removing the checkpoints and the borders also led to the free immigration of foreigners and to many internal disputes, and new challenges emerged, such as the struggle against terror and the absorption of migrants. Can Israel ignore Europe? Widespread among many Israelis is the approach that the Europeans are fundamentally anti-Semitic and therefore their relationship with Israel and the Jews will never actually change. It that correct? It is correct that anti-Semitism has never departed from the world, but Europe is not a single unit. Many anti-Israelis and anti-Semites exist throughout the political spectrum, from the extreme Right to the extreme Left, and the proof of this is the intensive activities of the BDS campaign and other non-profits and organizations. But when viewing the situation through the prism of realpolitik, is it not worthwhile to study the entirety of interests calmly, objectively, and without responding from the gut? It is clear that the past should not be forgotten, and much can be drawn from it for a better future. This was the thought at the time when German reparations were accepted, and it was decided to build full, flourishing diplomatic relations that have proven themselves to be beneficial until this day. 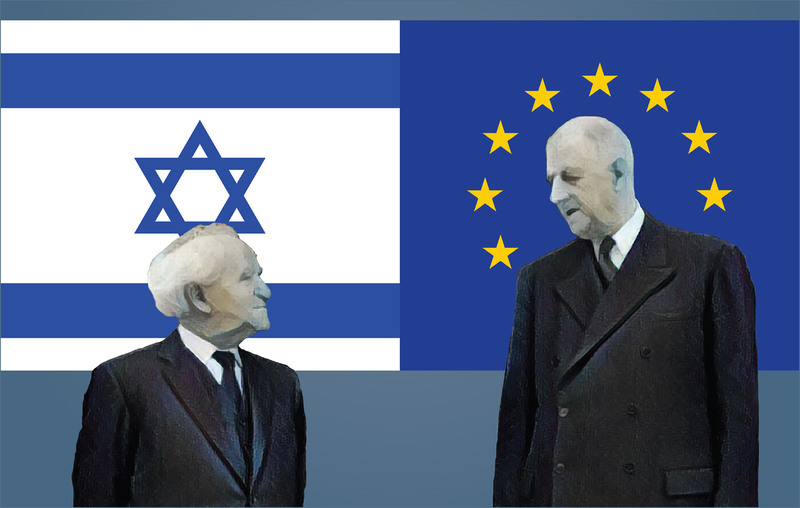 For this reason, to repair relations between the European Union and Israel, we must re-evaluate them correctly and pragmatically and not hang onto pre-conceived ideas. First, we should separate between the classic countries of Western Europe, such as France, Spain, and Italy, and those countries that used to be governed by the Communist bloc. These latter countries have a very varied population and different interests. They are certainly less involved or interested in resolving the Middle East conflict than France, for example. Last but not least, the countries of eastern and central Europe have a close relationship with Hungary, Romania, and the Czech Republic, which did not hesitate to abstain on resolutions supported by Europe against the transfer of the U.S. embassy to Jerusalem. Similarly, Israel’s relations with Greece, Bulgaria, and Cyprus have grown significantly. In other words, there is a positive trend that could not have existed in the past, and we should take note of it and welcome it. Second, there should be a clear distinction between EU leaders and the officials sitting in Brussels. The cumbersome, uncompromising, bureaucratic, group-thinking administration composed of clerks from 26 different countries and committees not elected by the public is given the highest authority in Brussels to make important resolutions on every issue, especially foreign policy issues connected to the Middle East and policy toward Israel. For example, Chancellor Angela Merkel’s response to Israel’s Nation-State Law that she would not interfere in the internal matters of the State of Israel was intelligent, and it would be better if this line were accepted among the other leaders of the European countries. Third, there should be a separation between bilateral political relations and multilateral relations, especially regarding anything related to the process of finding a solution to the Israeli-Arab conflict. Today, there is an understanding that this separation is important for both sides. It should also be noted that Israel has bilateral relations in all areas with each of the EU member states. With some, these relations are close and friendly, and with others, they are less so and could be improved. We should emphasize that Israel is also a member of the prominent and respected organization, the OECD (Organization for Economic Cooperation and Development). It has signed many agreements and has common interests in every economic, scientific, and energy-related field. It will also continue to be an active member of the Horizon 2020 project, and for the first time, it has representation in the NATO headquarters in Brussels. Israel has more shared interests than differences with Europe, more that is positive than negative. It has been joined at the hip to Europe since ancient times, from the Greek and Roman empires. Most of the Jewish people whose families were wiped out in the Holocaust lived in Europe even before the expulsion from Spain in 1492. In other words, the geography of the Mediterranean Basin and the historical past are strongly intertwined with Europe, and it is impossible to separate them and ignore these basic details. Furthermore, Judeo-Christian values overcome the obstacles and denunciations of the extremists. In the international arena today, Israel has many strategic, vital assets that can contribute to strong cooperation and strengthen its position. In light of Europe’s weakness and the strengthening of ties with the United States under President Trump and Putin’s Russia, the time is especially appropriate. For example, understandings on the Syrian issue, Iranian entrenchment, and the future of the Golan Heights are subjects that Europe cannot deal with diplomatically in the face of the persistence of the two superpowers. At the same time, the Palestinian issue should be dealt with in a similar way, and pragmatic, economic solutions should be found for Gaza, which Europe is interested in and can act upon on condition that this is well coordinated with Israel. In light of everything stated above, Israel must strive for a memorandum of understandings with the states of Europe. The first memorandum of its kind would facilitate proper relations in all areas between Israel and the Europeans where each side would know its interests from the start, as well as its limitations. There should not be a situation where each resolution or Israeli initiative automatically receives a reprimand or a moral lecture. It is also necessary to work to remove all boycotts and attempts to impose sanctions on Israel and prevent the European Union from indirectly financing hostile bodies and organizations, some of which support terror. This issue should be clarified because a fundamental mistake was made when the Israeli government decided to transfer authorities and budgets from the Foreign Ministry to other ministries. There was no justification for this, just like it is not possible to transfer Israeli PR to other or private bodies. It is a shame that political and personal considerations have overruled la Raison d’Etat, the interests of the country. It should also be explained that today there is no government ministry, such as the Foreign Ministry, with its many representatives around the world and its rich diplomatic experience, that can deal with the specific challenges raised by everything connected to the European Union, where it has its special embassy located in Brussels. Israel can contribute on many levels, thanks to its strategic assets, knowledge, and experience. This includes economic and humanitarian cooperation with the European Union in improving the situation of the Palestinians and providing aid to Africa. Joint treatment at the roots of the problems, at the source, will prevent the mass movement of migrants to the European continent. Of course, this includes cooperating as much as possible on the intelligence level and the war on terror. We recall the recent intelligence passed on to France about an Iranian attempt to commit a mass-casualty terror attack, as well as other warnings from the Israeli security services of potential terror attacks on airports and airplanes that ultimately prevented the loss of innocent European citizens. On this issue, we should hope for public and official recognition from the governments in Europe. We can certainly improve and strengthen our relations with the European Community, and the sooner there are positive, cooperative actions, the better. In summary, we would like to say that without any doubt, what is shared with Europe can overcome the divisions, and we can handle in the future any unnecessary rivalries or disputes.